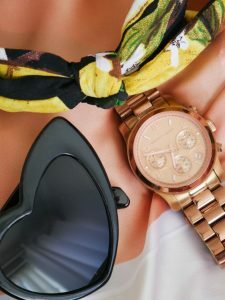 This Summer I’ve become a little bit obsessed with accessorising, buying lots of sunglasses, bangles and earrings depending on my mood. Head scarves and headbands also seem to be totting up in my collection too. I’ve got a bit of an obsession. Every year I find myself sticking to what I know. I actually think that my style gets a bit more boring around Summer time for some reason, but this year I vowed to make an effort and buy some interesting outfits. I’m saving a lot of them for when I go away though, I want to be able to wear them without needing a jacket because don’t we all do this? – but I have been a little sneakier in the accessories department. 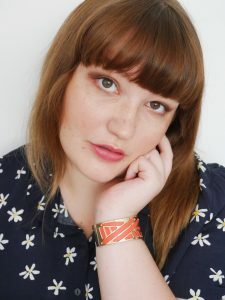 One brand that I’ve recently begun wearing is Les Georgettes*, they were kind enough to send me out a Ruban bracelet, which is a lovely red and gold cuff. These cuffs are customisable though, you can switch the leather inside but to be honest, I love the way the red and gold look so much I don’t think that I’ll bother switching it over! This is definitely a cuff that will look great with a tan, I’ve already decided which outfit I want to pair it with when I go away as I think it’s such a staple piece that really ties together a look. I wore it all day over the weekend and even though I find cuffs to be quite tricky to begin with, I find that after an hour or so I just get used to them and I don’t find it to be so in the way, and I even got some blogging done whilst wearing it! 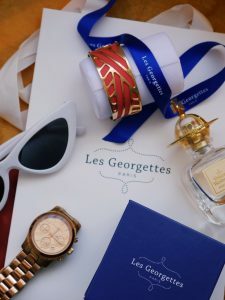 There are a lot of beautiful selections on the Les Georgettes website, and it’s not just limited to braceletes and cuffs either, you can find rings and necklaces too! I really love the quirky intricate designs on all of these bracelets, I get a very bauhaus mixed with Great Gatsby vibe off the designs and it really works. The packaging that your jewellery comes in is also simple yet beautiful, very sophisticated and not over the top (no glitter spilling everywhere), and it really gives you a good feeling about Les Georgettes. I’ve also been loving sunglasses this year. I’ve noticed a small glasses trend on Instagram, and as much as I love it, I have to stick to a happy medium. I’ve bought some small-ish sunglasses but they still fit and frame my face and protect my eyes from the sun, and I even had a Primark trip and treated myself to another pair. They’re the pink to purple ombre sunglasses, they’re pretty big and I actually don’t know what I’m going to wear them with, but I really like them and I think that they’re really fun, flamboyant sunglasses. For the past few months I’ve been paying close attention to American bloggers. I could never really get into the American blogs just because I couldn’t relate and I don’t really find them helpful for products since there is a lot available in America that isn’t available in the UK – but I do think that is a bit naive of me to think. 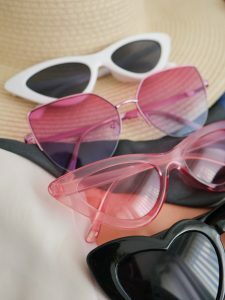 Trends can easily cross the pond, and I’ve noticed that cat eye love heart sunglasses have been trending over there quite a lot, so I decided why not search the internet and grab a pair? I think they’re really cool and I think they look hilarious too, they’re probably not something I’ll be seen out in because they’re absolutely massive which is a shocker since my face is pretty big, but I do like them and I think they’d be really cool for a fancy dress. I definitely don’t look as good in them as the American bloggers do. *This article contains sponsored content as well as affiliate links. Thank you to Les Georgette by Altese for sending me a bracelet! Next Post THE MODERN GIRLFRIEND: SHOULD YOU PUT YOUR MANS NEEDS BEFORE YOUR OWN? The heart-shaped sunglasses is EVERYTHING! !